Thu., Aug. 17, 2017, 8:15 a.m.
City officials across the country are nervously trying to figure out how to avoid becoming the next Charlottesville, Virginia, as alt-right leaders and white nationalist groups vow to stage more rallies in coming days. A group claiming it is advocating free speech has planned a rally for Saturday on the historic Boston Common, with a group advocating racial justice planning its own gathering in opposition. Boston officials said they have laid down strict conditions, including no sticks, weapons or backpacks. “Make no mistake: We do not welcome any hate groups to Boston, and we reject their message,” Mayor Marty Walsh (D) said Wednesday. A rally scheduled for Aug. 26 in San Francisco has prompted House Minority Leader Nancy Pelosi (D) and several California lawmakers to urge the National Park Service to rescind the permit to gather on federal park land there. Cities also are grappling with what to do about their Confederate monuments, an issue that has suddenly become much more urgent. Some are taking preemptive measures under the cover of night: Four Confederate monuments in Baltimore were hauled away in the early morning darkness Wednesday, and one in Birmingham, Alabama, was covered in plywood. In the wake of the violent public clashes in Charlottesville on Saturday, mayors, governors and other civic leaders are taking steps that even a week ago might not have seemed necessary. But they also are facing uncertain challenges, not knowing whether the white nationalist movement will attract a larger following or where the most turbulent demonstrations may occur. Violence is at the center of the concerns, and the Charlottesville rally showed law enforcement authorities that they need to be better prepared. Darrel Stephens, executive director of the Major Cities Chiefs Association, noted that many of the people who came to Charlottesville wore helmets and carried shields. Richard Spencer, an alt-right leader, said Wednesday in a text to the Washington Post that his movement will return to Charlottesville, where Heather Heyer, 32, was killed and many people seriously injured when a driver plowed into a crowd of counterprotesters. “This car accident or attack – we’re going to find out – was horrible, but the idea that it will destroy the identitarian movement is ridiculous,” Spencer said this week in a news conference at his office in Northern Virginia. Identitarian is Spencer’s preferred term, however, most experts who study the alt-right consider it a growing wing of the white supremacist movement. Only an empty pedestal remained where the figures of Confederate Gens. Robert E. Lee and Thomas J. “Stonewall” Jackson had been astride their war horses. Also gone: statues honoring Confederate women, Confederate soldiers and sailors, and Supreme Court Chief Justice Roger B. Taney – the author of the 1857 pro-slavery Dred Scott decision saying African Americans could not be citizens. Another statue of Taney is in Annapolis, on the grounds of the State House, and Maryland Gov. Larry Hogan (R) has reversed course and decided he wants it removed. “While we cannot hide from our history – nor should we – the time has come to make clear the difference between properly acknowledging our past and glorifying the darkest chapters of our history,” Hogan said. 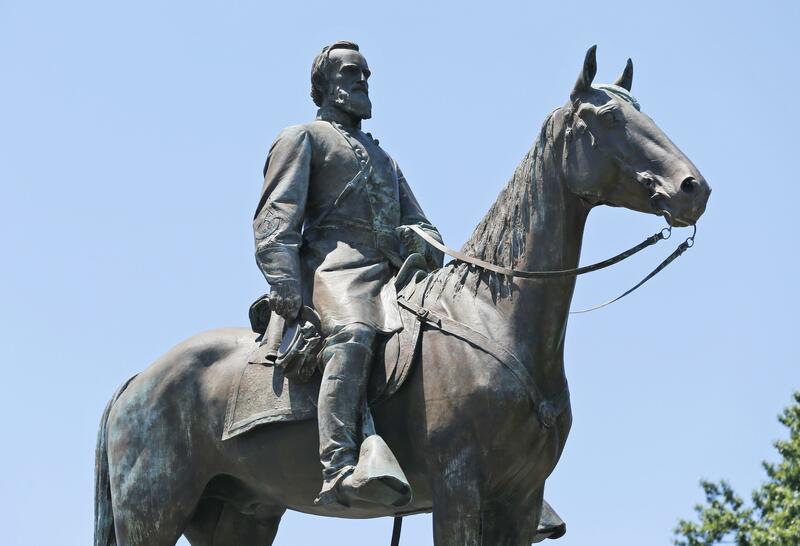 In Richmond, Virginia, once the capital of the Confederacy, Mayor Levar Stoney (D) announced a dramatic change of heart about the statues lining Monument Avenue. He had favored adding interpretive material to put the Confederate statues in context. But he said Charlottesville’s violence led him to a new conclusion – that the statues must go. Cities are worried that they could become flash points for public actions they have taken on behalf of their citizens. A working group of the Lexington-Fayette Urban County Council in Kentucky voted unanimously on Tuesday to move Confederate statues from their locations at the old county courthouse. The full council will vote on the measure Thursday, where it is expected to pass, Mayor Jim Gray said. If it does, the city will have to seek approval of the state Military Heritage Commission. The city’s attempt to move, rather than remove, Confederate monuments has not appeased white supremacists. Matthew Heimbach, chairman of the Traditionalist Worker Party – a white supremacist group – told the Lexington Herald-Leader that the organization is planning a rally there “sooner rather than later.” Lexington police are conferring with federal officials to prepare. In Birmingham, city officials covered a Confederate monument in a city park with plywood and tarps while lawyers studied the city’s options, as Alabama state law penalizes cities with a $25,000 fine if they violate a prohibition against removing monuments. Mayor William Bell (D) said the city has been looking into removing the monument for two years. The Unite the Right rally in Charlottesville made him worry, he said, that the monument would be “a lightning rod for organizations and individuals preaching hatred.” But the city is facing legal action from Alabama Attorney General Steve Marshall, who said that hiding the statue from public view“altered” or “otherwise disturbed” the memorial “in violation of the letter and spirit” of the law, leaving him no choice but to sue. Bell said he believes he will succeed in removal, but if not, he hopes the city can place markers nearby that describe the horrors of slavery. “There are two forces at work here: Whether or not we will continue to glorify an action that sought to end these United States of America as we know it today, and whether or not the state has the right to protect monuments that really speak to the suppression of human beings,” Bell said. Louisville Mayor Greg Fischer (D) directed the Louisville Commission on Public Art to develop a list of works that “can be interpreted to be honoring bigotry, racism and/or slavery,” so he can consider whether to add more art, move some of them around or add markers to better explain the artworks. Some cities want the Confederate monuments discarded by other cities. That’s the case in Brandenburg, Kentucky, which took a monument removed from the campus of the University of Louisville and dedicated it on Memorial Day. Published: Aug. 17, 2017, 8:15 a.m.